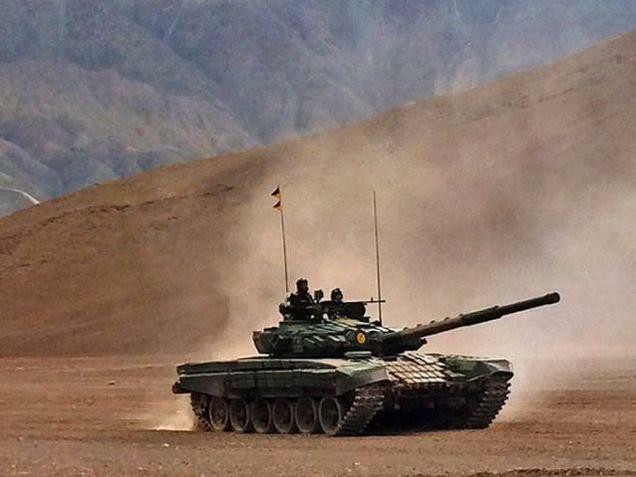 (TibetanReview.net, Jul21, 2016) – In order to ensure a level of parity with the Chinese built up in neighbouring occupied Tibet, India has deployed around a hundred Russian made T-72 tanks in the Ladakh region of Jammu and Kashmir, ibtimes.co.uk Jul 19. China had matched its build up with aggressive posturing which saw a number of border intrusions in recent years, including a few serious ones which required diplomatic interactions between Beijing and New Delhi. The report said the deployment of the T-72 tanks in the remote mountainous region was directly aimed at challenging what India sees as Beijing’s aggressive stance in the border area. The report noted that the latest incursion by the PLA (ie, the Chinese People’s Liberation Army) was on Mar 8 this year when Chinese troops entered almost six km near the Pangong lake area of Ladakh region. It added that the move was thwarted by the Indo-Tibetan Border Police (ITBP). The Chinese went back after a two-hour verbal duel with their Indian counterpart. The report noted that this was the second time in history that India had deployed the T-72 tanks in the Himalayan region. The first was in 1962 during the Indo-China war, when the Indian Army airdropped five tanks in Ladakh, which has seen frequent incursions by the People’s Liberation Army of China. The report noted that the first deployment took place in 2014, with the second one happening in 2015 to be followed by a third this year, resulting in the formation of a full tank brigade.